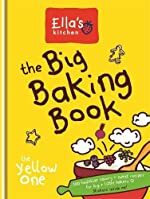 The Big Baking Book by Ella's Kitchen. An Ella's Kitchen Book. Review: Do you love to bake and try out new recipes? What about recipes that are healthy but still delicious? Then The Big Baking Book by Ella's kitchen is the book for you! The Big Baking Book has 100 healthy and yummy recipes to make with your family. There are extra activities such as pictures you can color, crafts for the food you make and fun quizzes at the beginning of each chapter. Each chapter has a different subject such as breakfast, lunch, dinner, snacks and desserts. The Big Baking Book is meant for preschoolers and adults. In The Big Baking Book, there is a recipe called the "Cheerful Monkey Cream Puffs" on page 136. I made these cream puffs and they had really easy instructions to follow. They also needed very little adult supervision with only an oven and heating some ingredients up on the stove. The puffs turned out delicious and they are also very healthy. I really enjoyed The Big Baking Book and I think you will too. We would like to thank Hamlyn Books for providing a copy of The Big Baking Book for this review. Have you read The Big Baking Book? How would you rate it?